In conjunction with the 50th anniversary of the Memovox Polaris, Jaeger-LeCoultre has introduced the all-new Polaris line with five models that pay tribute to the historical sports reference. The new Polaris timepieces clearly share DNA with the original, but they have also been imbued with modern touches and aren’t merely exact remakes. Of the five, the Polaris Chronograph is the perhaps the one that has the best balance between form and function. In a way, it is the piece that legitimises the Polaris as a collection; after all, what’s a sports watch line without a chronograph model in it? 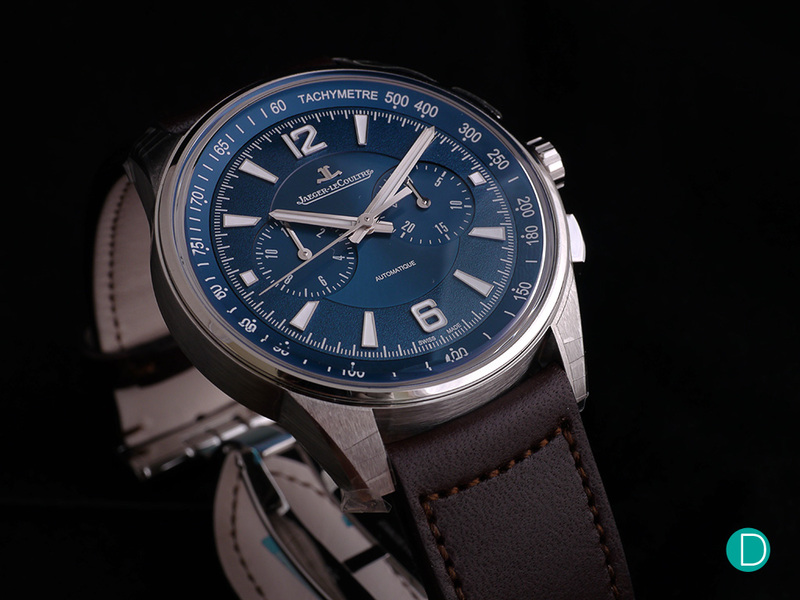 Here, we bring you the details and our thoughts on the new and rather charming Jaeger-LeCoultre Polaris Chronograph. While not the largest watch in the collection (that honour goes to the Chronograph WT), the Polaris Chronograph still has a modern build at 42 mm in diameter and 11.9 mm in thickness. These dimensions are very much within the norms of today’s sports chronographs. For smaller wrists, the short, downturn lugs will aid tremendously in wearability. The case comes in either rose gold or stainless steel for a dressier or more casual look. The mostly brushed case is highlighted by a thin, polished bezel and polished bevels along the edges of the lugs. On the flanks are two pushers to start, stop and reset the chronograph function, and a crown for winding and time-setting. With water resistance of up to 100 m, the watch is suited for swimming and shallow diving, though probably not if you’re wearing one with leather straps (there is a stainless steel bracelet option for water sports). The Polaris Chronograph comes with a modern-sized case but its short, downturn lugs will enable those with smaller wrists to wear it as well. If you’re into finissage, then the dial of the Polaris Chronograph will surely intrigue. It features multiple types of surface finishes that complement one another: brushed sunburst in the center, concentric guilloche in the twin chronograph registers, graining on the hour marker ring and opaline on the tachymetre scale. The end result is a dial with sophisticated yet charming aesthetics on which the hands, appliques and chronograph displays are laid. The choice of a bi-compax chronograph display adds to the vintage feel of the watch and results in a well-balanced dial. The minute and hour chronograph sub-registers dwell at the 3 and 9 o’clock positions, respectively. For nighttime visibility, the hour markers as well as the index-style hour and minute hands are coated with luminescent material. Legibility is excellent on the Polaris Chronograph; while the dial isn’t as clean as that of the original Memovox Polaris, it has been designed to convey information effectively. Oh and for once, there’s no date aperture to be found! The Polaris Chronograph has an evocative dial featuring multiple types of finishes and multiple depths. The lack of a date display also contributes to its pristine appearance. The 262-part, 37-jewel Calibre 751H that powers the Polaris Chronograph is a Jaeger-LeCoultre manufacture movement. 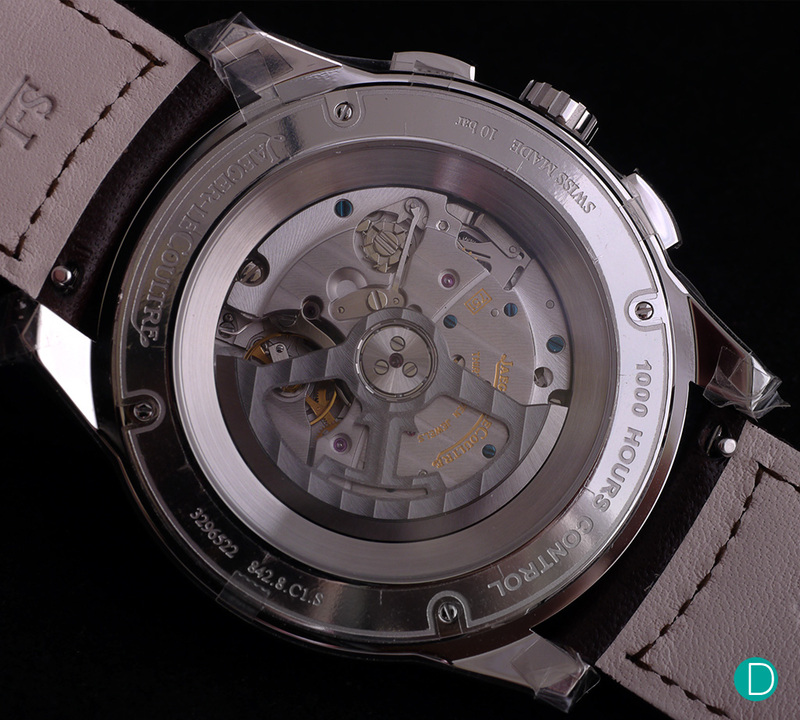 The twin barrel, automatic movement has a power reserve of 65 hours while operating at a contemporary 4 Hz beat rate. Its chronograph mechanism utilises a column wheel and a vertical clutch – as such, the chronograph can be left running indefinitely without introducing additional wear and tear. This gives the user the option to use the chronograph seconds as running seconds; it’s not a perfect substitute but it’s better than nothing. 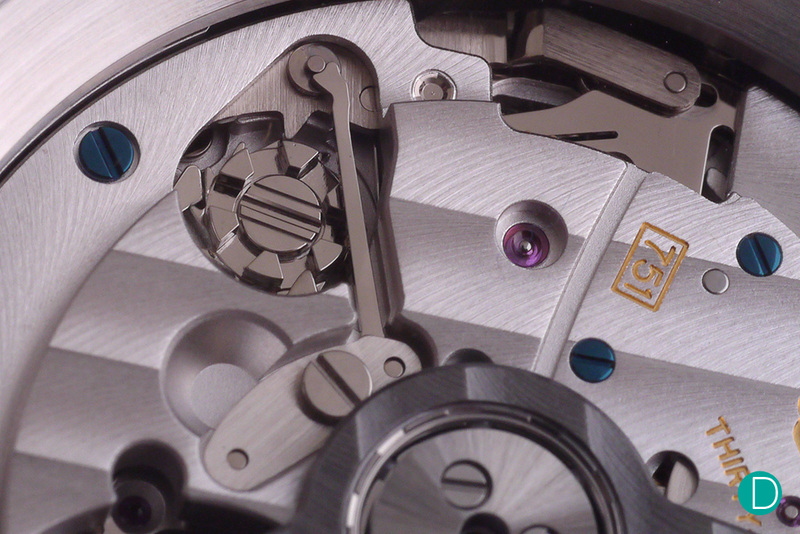 The Calibre 751H, viewed through the sapphire crystal case back. From a finishing and decoration standpoint, the Calibre 751H isn’t exactly beauty pageant material. 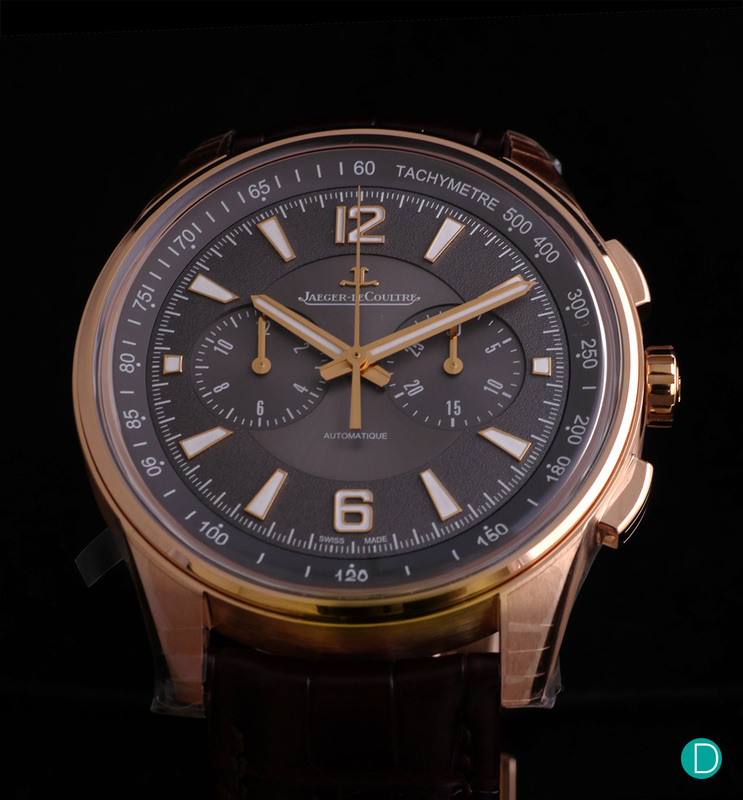 At this price point, Jaeger-LeCoultre finishes its movements in large part by machine and thus the fine touches you see in the brand’s high-end calibres are simply not present. All that said, the finissage is neat and beyond what is needed for optimal function. In our books, there is nothing wrong with sacrificing superfluous finishing if it means being able to deliver more from the technical side of the movement for a lower price. Close-up view of the polished column wheel of the Calibre 751G. The Polaris Chronograph is available in multiple variations: the black dial version comes in stainless steel with either a bracelet (USD10,900 or SGD16,700), alligator leather strap (USD10,100 or SGD15,300) or calfskin leather strap (USD10,000); the blue dial version comes in stainless steel with either a bracelet (USD10,900 or SGD16,700) or calfskin leather strap (USD10,000); the charcoal grey dial version comes only in rose gold with an alligator leather strap (USD24,500 or SGD36,400). In our eyes, the stainless steel variants of the watch represent good value, at least within the realm of luxury watches. That should come as no surprise from Jaeger-LeCoultre. The Polaris Chronograph comes in several iterations to suit different tastes and preferences. 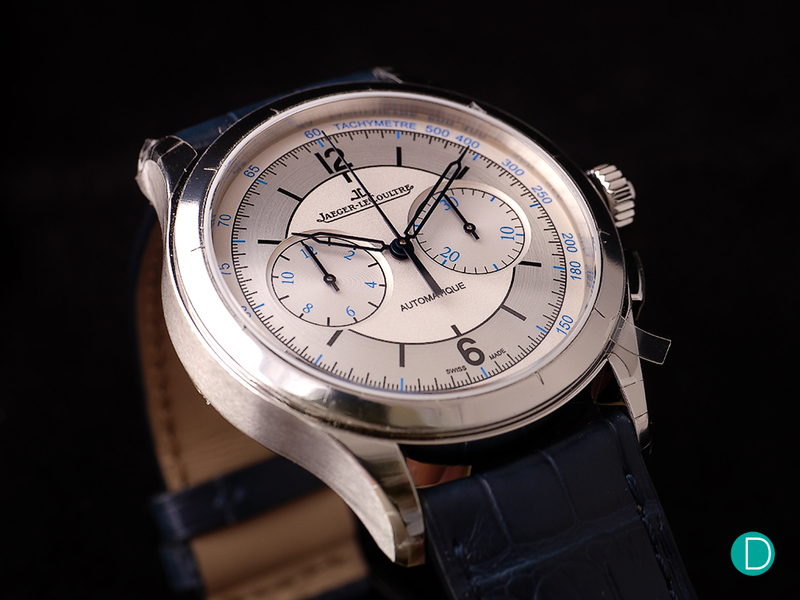 If the vintage look of the Polaris Chronograph is what you’re after but wished it was dressier, then look no further than Jaeger-LeCoultre’s own Master Control Chronograph. Priced at USD8,000, the new Master Control Chronograph is 20% less costly than the Polaris. The watch has been well-received by the community for its gorgeous sector dial and skeletonised syringe hand design. It also features a similar – albeit less aesthetically refined – movement to the Polaris: the Calibre 751G. The new 2017 Master Control Chronograph is a hit with the watch community with its beguiling old-school look. 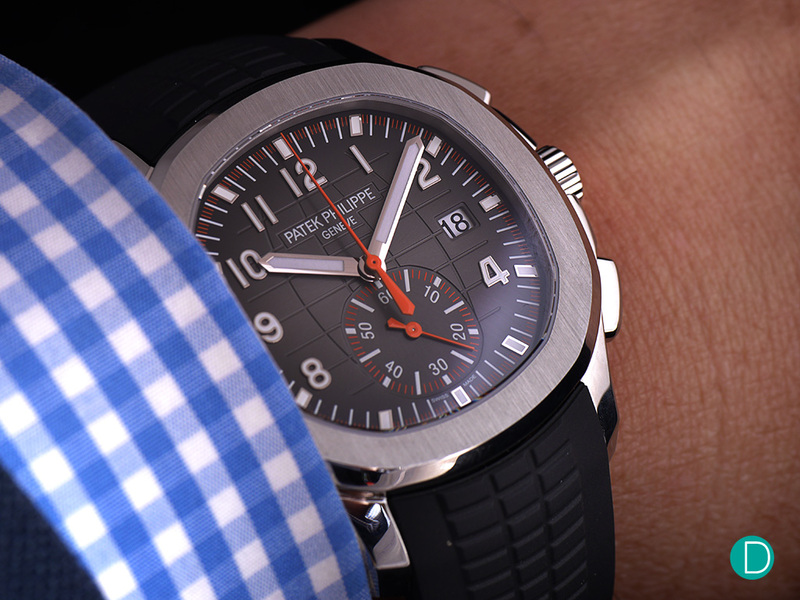 If money is no object, then the new Patek Philippe Aquanaut Chronograph Ref. 5968A should be considered. At CHF38,600 or SGD57,700, it is almost 4 times the price of the Polaris Chronograph. What you get in return for the premium is superior finishing worthy of haute haulogerie. Everything on the Patek looks that much more defined and refined, from the case and pushers, to the dial and hands, and all the way to the unseen parts of the movement. Like the Polaris, the Aquanaut Chronograph is also a vertical clutch/column wheel chronograph. 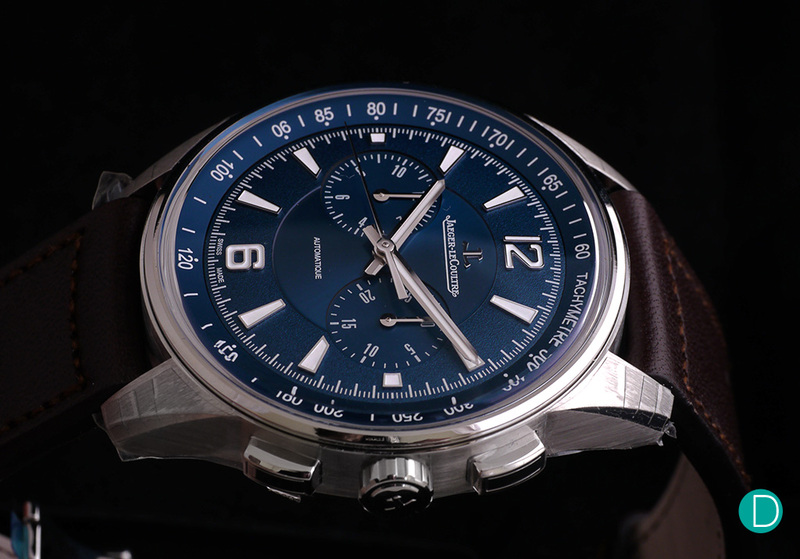 In addition, it also has a chronograph flyback and date function. The question is: is all that worth 4 Polaris Chronographs? If you’re fussy about finissage and brand prestige, then yes. But if not, the Polaris Chronograph should provide you more joy and some cash to spare. The new Ref. 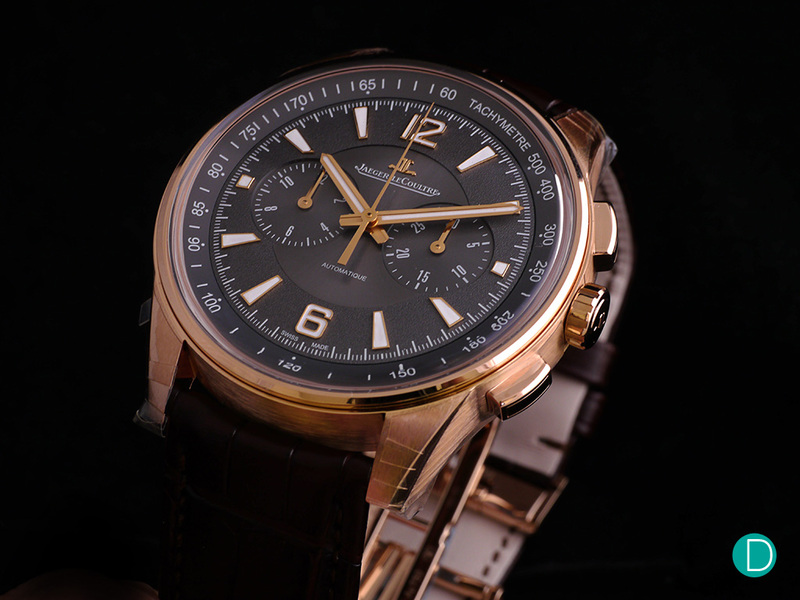 5968A is Patek Philippe’s sportiest (most accessible) chronograph. Of course, it is stamped with the Patek Philippe Seal, guaranteeing the quality of timekeeping, construction and finish. In the new Polaris collection, Jaeger-LeCoultre have got a winner in their hands. The Polaris Chronograph is the one where we feel a balance between form and function has been struck. It is more functional than the Polaris Automatic while being less cluttered and clunky than the Polaris Chronograph WT. The Polaris Chronograph is one of those watches you can’t help but cheer for, with its charming design (enjoy the wrist roll video below) and fair pricing. And if we had to speculate, it’s probably also one of those watches that will have no trouble finding new homes on wrists.